Salted and ready to rock! Cooked over a scorching hot fire with a little peach wood. 1.5 min rotate, 1 min flip - 1 min rotate - 1 more min pull & finished in a "warm" CI skillet with some porcini butter and cherry smoked salt. Separated the cap from the "eye". Either it was "black & blue" or "medium" - no sous vide (yet) and this was about the best I can do..
Ribeye cap - simply outrageous!! WOW! And the sides: home made coleslaw with a hint of 'sauce - much like a chopped salad; not very "wet" with coleslaw sauce. Absolutely insane. This piece of meat was so rich, and the dry aging process added so much complexity to the meat. A little sweet, nutty, smoky, cheesy. I won't lie. I struggled to eat this small piece of meat. Words simply cannot describe how wonderful this steak was. Hands down the best steak I have ever had - overall. I love the texture of a strip, and I am really impressed with bone-in Filets. But this steak.. was simply a notch above anything I have ever eaten. I may get flack for the overall doneness of this piece of meat, but I do not like a charred crust and a "luke-warm" center (ala black n blue). Two fold. A "texture" thing, for me, and I wanted the marbling throughout the piece of meat to render completely. Sharing this meal with a lady friend would have been extra-special, but unfortunately for me, this 27-year old simply cannot find "the one". One day.. One day. Flack?? No Steak Man, I won't be going you flack. Doneness is all preference...and my preference is medium-rare for all fine beef cuts. Steak for one? You're not doing that fine cut of beef any justice. If I grill steak for more than 3, I'll use the egg or eggs. For one, you're missing out on so much flavor by searing them on the grill. Incredible steaks are all about a nice even mahogany crust. The enhanced flavor is 2nd to none when you sear on a cast iron or stainless steel pan. Try it next time Steak Man. I see on one of your other steak cooks that you pan seared in bacon grease. Why did this one not get the same love Steak Man? Ok @FLbobecu‌ I'm liking the steaks. Here lately I've been doing a lot of steaks. I've never used porcini butter or cherry smoked salt (nor have I heard of it --guess I need to get out more ) ). What do these add to the steak? Would LandOLakes sweet cream unsalted do the same justice? That's what I've been using. Oh and love the knife! The video on the knife skills...YouTube? I've been cooking in the CI a lot. I started on the Egg, and finished in a warm CI skillet with porcini butter. Just thought I'd change it up a little bit. That's all. The porcini butter is a "concentrate" if you will - of mushroom flavor (porcini mushrooms)+ butter (think compound butter). I received it as a sample from work, and have a few more uses out of it before it's all gone. Figured since I have it, why not finish it up? The cherry smoked sea salt adds an additional "smokiness" to the butter, from which the steak was cooked on (abet quick). I was going for a grilled/smoky flavor profile this time, with hints of mushrooms and smoky salt. Very well executed, I thought. Just very tricky to finish @ MR for a thinner steak like this. Video is not on YouTube - yet. I think I can make that happen. It's my first video I have made on my phone, and would be my first YT video as well. I'll see if I can get it uploaded after work today. I'm going with Yum! I may have pulled it a little sooner but I would have enjoyed that Steak. Hey Cazzy, Can you share more info on searing a steak in a CI or Stainless Steal, are you cooking start to finish in the Pan? Looks incredible! BTW you don't need a sous vide for steak. Just use hot water for an hour per inch of thickness. 100 - 120*. No worries about the danger zone for the short time. It's pretty standard practice in most fancy steak houses. I usually do it a couple ways. I will sear the steak, then butter baste to finish the steak or I will finish the steak in the pan in a 400 degree oven. You can also finish roasting on the egg, or reverse-sear. Lots of options here. 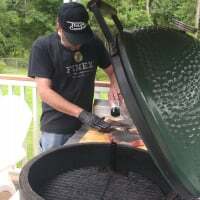 You can also get a flat top for your egg....like a baking steel or one of the lodge flat tops. You just need a flat surface that retains heat well so your steak gets an even crust. If you sear first, do your best to dry the steak with paper towels as it will eliminate moisture. That will ensure the steak doesn't steam while the moisture evaporates. That is awesome!!! Thanks for posting! Hmm.. Have no idea what that is. Suppose I should look into it. I don't even use Facebook. I see what it does to the people around me. 6 people sitting at a lunch table and not a single person is conversing out loud. Now, it's all done electronically. Call me old fashion. It is what it is.